A freeform experiment in magic, creativity, healing and alchemy, guided by circumstance, and with destiny providing the attractor. In a previous art ritual, that took place over 5 years, an elixir was created, an elixir born from the pure spring water of St Helen's Spring, Hastings, Sussex, England. The water source was discovered, excavated and cleared through pure healing intentions, offered with a rare pure silver Glastonbury vessel, and amplified through the power of an Earth Mandala. The subtle and interconnected ingredients were blended in a large antique crystal chalice. And these were formulated and mapped in magical mandala process, identifying the essential components as spring water, CBD oil, honey, gold, yew and prayer. The final process recorded in this mandala, the elixir being identified of relationship to cancer. The elixir realised and completed, now forming the cornerstone of the coming art ritual. I will seek extraordinary assistance for this coming art ritual. As Winter Solstice 2015 approached I focused my mind, seeking both an internal and external alignment for my intention, to initiate this imaginary medicine. And my intention? A world without suffering. Through geology, history, astronomy, mythology, astrology and tradition. Place your wish into this chalice of dreams. Together, they will become a medicine for this world. And then, we began our Solstice Journey, to welcome the moment of transition, from the long dark night into the golden light of dawn, with the synthesised magic of 25. Our solstice prayer for the healing of the world's waters. As the sun rises, the purity of your heart song will be known by the living waters. Thus they will carry blessings for the compassionate, blessings for the kind, and blessings for the wise. Be like water - Live in harmony, flow with decision and quiet power. The longest, darkest night of the year came, and went. During that night, ancient magic and ritual play happens, as the spirit seed of the coming year was planted. Alchemy: The transmutation of a dull leaden mind into a Golden Consciousness. As the Sun/Son rises after the long dark night of the soul, golden drops of medicine nectar descend through your crown chakra, to combine within the golden vessel of your heart chakra. Now you are the alchemist, whose love is the medicine for this world, and your long journey is witnessed and celebrated by the soul of Gaia. May the purity of compassion flow within your veins, and your every breath be that of ease and acceptance. We are one - as warriors of wisdom, bearers of the light, and as gifted listeners. May we, the healers, be prepared for this coming time of service, as I am another of you. And held in place by heaven's wish, is the Pole Star, the stillpoint in the Northern night sky, whose silent witness maintains the circular motion of the great external wonder. We beckoned that stillpoint by creating a be-jewelled map, as an act of service to the initiation of the Medicine's Seed. For value has no price, and worth is merely the measure of thy worldly dream, and diamond within is the treasure of all souls. There is a single moment, when the year turns, and the year glass is turned, upon the passing of the single last grain of time, and this is the time for magical alignment - intention with both inner and outer topography. Finding the Pole Star, through the instructions of The Plough, enables the essence of interconnectivity in the imagination of the healer. Holding a cut quartz crystal, anointed with Spikenard, in accordance with the wise woman's advice, we paused during the Vajrayogini Puja, at the line 'He came to rest in the forest hut beyond words, thoughts and expressions'. I cried, as I realised the immediacy of the Holy Truth. And a script appeared upon the face of the crystal, described as 'Dakini Script' - that bore a message, an incantation of encouragement, excitation and stimulation. The interpretation is for you, alone. The Rainbow Light of the icosahedron captured the expression of impermanence and emptiness, the formlessness of the Truth Body, and blessed the medicinal seed, now held in Gaia's graceful heart. For within the forest, the stillness is shared, and renewal begins as the journey of the year begins, and the Medicine Project begins. Renewal, regrowth and rebirth, where the latent rising power enables the Yogini. A falling star, balanced upon infinity's call, awaits an angel's tears. Falling indigo tears of an infinite age, entwined within a golden gossamer. Tears knowing the futility of war, and the pain of those at war within themselves. May they be released from fear. May the water be forever pure. Release the star, as would an angel. And the year's work begins. The graceful dance of moon and sun plays around our world, creating light and shadow, re-fractal through the lattice of the crystalline matrix. Over 13 moons the year is measured, recording the heartbeat with each turn of tide, calling the deep pulse of life within the fecundity of Gaia's ovulation. And thus birth is known. The Great Golden Pathway - Sustainer of life, giver of light, whose weave entwines and enshrines from within. In sweet musical counterpoint, the song of yearning is called from the alchemist's heart, in preparation for the great work of purity. Unravel the myths, deconstruct all barriers to understanding - experience the source of Divinity. The ritual has arisen and woken, gifted upon this Golden Dawn. She is known as the Amethyst Moon, she who ends the cycle, to greet the beginning. For of this journey, 13 is the initial stepping stone, as she travels the linked lunar path of the year. In multi-faceted capture, each glimpse of the infinite perspective aligns with the alchemist's intentions. Where shadow is the union of day and night. Gaia resides, suspended in the life energy of the Great Maestro, our Sun. She who plays with the moon's light, as a marionettist, interwoven with delicate torque structures of imaginal lines. The fine symmetry of orbits speaks the silence of conversation, in wax and wane, and through the rebirthing cycle of full thru’ new, she will claim your ring finger, and engage you with her presence. For in the obscurity of darkness, the unacknowledged shadow within remains, awaiting recognition, awaiting healing. For who can deny the interconnectivity of all things, and the possibility of limitless potentials. Here is found the Akashic Library of all histories. Each day, as the sun rises above the oculus, light permeates the spherical cube, dispelling the inner darkness. The particulate glimpse of sunlight reflects upon each mote of dust, illuminating the secret inner topographies, enabling insight and wisdom. Rise and Shine. Carpe Diem. The alchemist views the sky through the oculus, from the warmth of the seat at the heart of the inner library, into the soft hues of the eclipsing moon. The eye into the sky that the architect creates to view the heavens is an expansion of that through which we see - 'Your eyes don't see, your brain sees'. Rewarded, as the spectrum of the rainbow's high note sings the violet flame, ignited in the soul of you, the alchemist, as the moonlight breathes cool light within the night of the forest. The first moon cycle of the Great 13 has now completed, and the advancement of the medicine has reached the ears of those who work with herbs, incenses and oils, and the refinement of the formulae has commenced. The magica arma, and preparation for the new moon cycle is initiated, utilising Mandala, Madeira Citrine & Emerald, and this upon the day of the Tibetan New Year of the Monkey (Moon Key). For the gold has reached the waters, and distribution has begun. The magic of gold, that most fascinating of metals, has been noted and valued for its mysterious of healing qualities. We have worn gold close to our bodies for millennia, as a display of power and wealth, and also for symbolic and ritualistic purposes, and also, perhaps, as the subtle interface between pure gold and our skins imparts an empowering and healing quality to our lives. Spiritual Bathing - Twin souls participate in a global process of healing and activation. Whereupon countless golden drops take the journey of eternal depth, carrying the intention of responsibility. Borne upon pearlescent waters, the daily ritual of cleansing and purification is theirs, released in fulfilment, and completed upon understanding the gifts of love. To see reborn, the Great Spiral Galaxy. Falling droplets capture the sunlight, raining fertility upon her imagination. From the invisible depths of source, release emotional refractions and reflections, as you re-circulate and renew your exuberance and expression. Drink the immediacy of clarity, be refreshed, by the Fountain of Inner Reflections. We met, drank orange blossom tea, and talked at the house of the tea-maker. The pure 24ct Gold Oil sat upon the gifted mandala, sitting perfectly in the centre circle, choreographed by synchronicity. And we wove plans of apothecaries and magical workings. And here Ms Pulver is energising and activating her medicine, upon the full moon, from the throat chakra source of London's pure waters. And unbeknownst to many, the key activation, purification and distribution of the Medicine has begun, carried upon the blessings of intention, and amplified through the power of water's hidden networks of communication. From the garden in the forest I gaze into the pool of perfect dew that sits upon her morning smile. And as dawn arises, the alchemist collects bejewelled, sacred drops of purity from this, most magical of plants, in preparation for the Great Work. And too, for those who seek eternal beauty, and the allure of Elfin radiance, know this plant as your friend, known in the Arabic traditions as - 'Little Magical One'. Gaze into the pool, and dive deep into the spiralling wonderment of dreams, to arise with shimmering tingles upon your skin. We are crossing the threshold into spring's verdant energy, and she will carry the flowering passion of the world's healers into the coming light. And the distillation, refinement and formulae shall manifest. Extending into the journey of the Lunar, we entered moon cycle twelve, overlaid with Madeira Citrine and Emerald, reflecting in the early spring sunshine. Gold, water, light and intention in alignment. For the process of alchemy and magic is one of great mystery, one that reveals her face, in gentle surrender to the calling of time, and we the healers adjust our work in response to the emergence of reality. As the medicine gathers, stirs and evolves within the soul of the alchemist, he dreams of the great tapestry, that whose vision will heal this world. And he heard the tale of the Golden Thread Turtle, whose journey was that of miraculous synchronicity and alignment. The gold is now coursing through the veins of Gaia, calling the next process in this magical journey. And amongst the encyclopaedia of symbology are aspects and elements from which the alchemist draws inspiration and reference. The Caduceus - Magical Staff of Hermes Gifted to Hermes, by Apollo, the God of light and the sun, truth and prophecy, healing and art, in exchange for a magical flute. Hermes, the messenger, carried his Caduceus, and if applied to the dying, their death will be gentle. A peaceful death: The gift of releasing the mind/soul from the physical, to loosen and free the knots around the heart chakra, and to know freedom at the time of death. And, thus, through the arousal of Kundalini, ascending through the 7 chakras, following the serpentine journeys of Ida and Pingala, to facilitate opening of the crown chakra. Higher rebirth, gifted opportunities and continuation of the Path to Enlightenment - the meaning of this lifetime's work. From the depths of the great deep blue ocean of being, the blind turtle rises to the surface, once every 100 years, to breathe in the clean air.And as the sun's light reflects upon her distinctive shell, awareness is signalled to your open heart. For you know your destiny, as you glimpse your close potential with eyes opening wide - the final perfection of your soul. You breathe.. A long slow inhale. Old patterns - spiralling from the depths of your mind, to be cleansed away as the sunshine of your love greets the lost memories and bids them a final farewell. Forgiveness, and the purification of release, mirrored in the evolution of planetary consciousness, and our shared responsibility and gifts. From the primordial OM, the Sri Yantra is born, and reveals the raising of the Great Pyramid of Giza. Why might this not be the truth? A little impossible perhaps, but tell me - what is not a little impossible? There is a moment, when the light passes through the crystal lattice, and the rainbow light appears. The stability of the pyramid form, recognised throughout time, is the primary structure of the 3 dimensional world we inhabit, the geometric basis upon which all exists, functions and manifests. 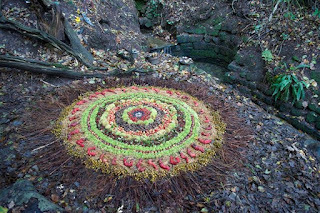 This mandala represents my intention to capture the instant of Solstice, as the sun passed through the high kiss of its annual curve. And in this way, the seeded potential for all beings to attain the Rainbow Body shall manifest. A bold call, I know - but in this imaginal world we inhabit, the interplay of light and geometry forms the very basis of our visual experience. And in this way we began to play with the universal play of alignments, to stimulate and activate the gathering medicine energies for the year's great work. At the mid-point, between Winter Solstice and Spring Equinox, we have Imbolc, the first of the cross quarter festivals, and here at Sweet Spot, by the Meadow, we aligned our jewelled night sky mandalas with the rising energies of the coming spring. We are measuring time, an age old practice of the alchemists. The great stone markers of the Western World, an inspiration for those who wish to work with longevity and sincerity - place your stones carefully and precisely. And so we played, with our imaginations and our magical toys. The great Cornish serpentine egg caught the last light and shadow in the laboratory, late one night, as we measured time, as music of the soul. Time: Ever Present Transfixed, and held for an eternal moment, the golden grains of time may tell their great story. And they listen well, they hear you well, as you too are of this great story. You - Seeker of balanced perfection, holder of the destiny of futures; Speak with time, share your light, and in this way time shall be your friend. And in this way, we work with a growing intensity and sensitivity, awaiting the later gifts of Summer. Your Centre of Balance Find weightlessness within your heart chakra, and expand within the structure of limitations, to breathe apart the walls of confinement. Freedom awaits within, suspended in anticipation, to hear your soul's call. For within the symmetry of inner peace resides the union of bliss and emptiness, the gifts of Enlightenment, to those who seek peace within. Fly upon your balanced wings dear one, to the Celestial Palace of creation's dream, where perfection awaits your arrival, as your burdens are released. Breathe the sound of inner peace. For all apothecarists work with careful measure. The key and the lock, two elements that must come together in order for the door to open. In a sacred dance, each gentle touch of the healer's fingertips spiral towards the heart of love. And as the adept might listen to the tumbling combinations within the deep locked vault, those who seek to share affection must listen, carefully, with tender empathy. For the accomplishment is communication, freed and surrendered, released from the structure of withdrawal. Acceptance too, of the abandonment of the gender roles, those dictated by the past, as the journey to union, the final cessation of the prison of duality dawns upon the rising understanding of those souls who yearn for peace within. And this dance is that of the Tantra. By these magical rules, the medicine will manifest, predicated upon intention - A Medicine for the World. The Alchemist visions a fractal cartography of the invisible landscape. A series of intersecting lines and incidents formulated through triangulation. The map-maker is humbled by the presence of Gaia, as he is asked to be her assistant... He listens. He is but a child however, and thus shall be encouraged, as a gentle mother would empower her son. Let us play in this playground, boy called Mark. Creating medicines need not be a serious matter. The illusionist juggles his imagination, knowing the nature of matter. Ninety nine point nine, nine, nine percent of all that is empty space. Our 5 senses convince us otherwise in subtle yet profound deception, and supported by the stories of our science and fables of all histories, we are further entrenched and reinforced into our acceptance of reality, these too being validated only by the language of matter. The truth is in emptiness. So we, creators of the mystic, can map a universe of limitless perfection, in the manner of our dreams, where quantum expressions multiply exponentially.... to manifest sequentially. Each thought is a building block, and your imagination is your vision board. We are children of the universe, with a fine box of toys. The temple of expanding wisdom will open through your crown, through the 13 esoteric chakras in alignment with the 13 moon yogas, constructing the ribs and support of your light body. Opening upon every breath, expanding into magnificent potential, as you burst with brilliance. And see, the spring time brings her energy to the woodland crucible called 'Sweet Spot by the Meadow' - for here the Alchemist lives with his Consort, she who is called The Feathered One - Beacon of Light in the Forest. For here we find the strange exotic primitive life, so overlooked by those who pass life in a hurry. We capture her moon drops, in preparation for the 13 Moon Yogas. Released from the womb of the mother of origin, upon the cycles of moon and journey of sun. She releases divine wisdom, creating a reflection of herself, and thus she is self-knowing - whereupon the indoctrination of guilt within the myth of apple and serpent are washed away from her sacred garden. Her period of moon night insights births inspiration, as she awaken to re-discover the healing powers of her menses. Witness this woman, as she rises. Gathering as she walks the forest paths, selecting both fine and rare, with an eye that values the overlooked. She renders the invisible, visible - with her keen eyes. If it can be imagined, it can manifest. The architect/designer conceives his project, in imagination, and renders it upon paper, and thus thought gains life in 2 dimensions - it now exists outside of the mind. Gathering the subtle energies from various medicines, she builds the model, the structure is actualised in 3 dimensions, but wait - there is more. She called the bird to her palm, as the forest had heard her song. He is the map-maker, she is the captain. In the Beginning - Perhaps the most powerful 3 words of the Western World, for contained therein is the absolute implied authority of the story of creation. In order to create a medicine for the world I have dreamed of a time before creation, in a place of nowhere, and a space uninhabited by time. A place of silent potential, where the smallest adjustment will extrapolate exponentially into the new world. A story that each can write. For what we have is that of a dream, where we are holders of the entire history of the birth and death of the universe, gathered within as lessons taught and ideas collected. All that is and shall ever be is held within Lorig, Lamrim, Lojong and Mahamudra. From the point of eternal origin, of all places, creation had a dream of herself - she watched the forms of matter dancing out of the light. Her silent whisper begat the spectrum, birthed through the primary colours of this world, as she breathed her sigh of release. Each new born child smiled with pure innocence, reflected in the hearts of all men, who put down their weapons, and ceased to harm. Thus the Mother of Creation could rest awhile. In this Beginning. Extending from the heart of the central sun, and reaching deep into the infinite, the lady of the forest pauses the breath of the cosmos - To birth the constellation of the Feathered One. For woven within her golden hair are the dreams and hopes of the healers of this world - You, who feel the World's suffering. And upon seeing her confident gaze, and assured alignment, the radiant stars breathe, whilst the silver moons smile, to witness the holy gifts she offers. She holds a delicate balance of sacred union, of both elements and magic, to the seed the perfect medicine, of Gaia's soul release. The dark, deep strength of the yew is known to her, as she tastes the honey nectar of our ancient wisdoms. So! Release thy arrow, straight and pure, and deliver thy spell deep into the ocean of awakening consciousness. And we shall know the alchemical power of the cleansing fire of absolution of ego. Purified, to be released from the bonds of attachment. Thus her heart sighs, and peace is seeded, as the constellation of the Feathered One awaits your smiling glimpse into the night skies. The night sky holds the peacock star cluster, whilst those born of turquoise eyes witness the celestial joy of the divine song. Whose golden filaments of evolving beauty, breathe sweet sensuous lines of flowing energy that enrapture with their radiant glow of being. And births the constellation called The Feathered One - her of the pure indigo night of remembered names. These tiny shoots reach towards the early spring light, eager to reach the skies above, and gain empowerment. And we, as dwellers amongst the trees, skies and light reach too, into the morning light, as we seek to make our medicinal essences. Working though the journey of the 13 Moon Yogas, we reached this, with rock crystals and Herkimer diamond gathering the energy of the 11th Mandala, reflecting potentials of magnificence, in preparation of distillation into one. For all the expectations we hold for the future, awaits the unforeseen aspect, the vital sparks of activation and co-creation. For in amongst the quantum fields of cross pollination reside the hidden potentials - that which is blown by the profound winds of karma. Thence the unexpected manifests in our seemingly clockwork universe, as the dawn greets the story of today. Today, which we have planned and sketched out in our imaginations, remains unwritten, awaiting our conversation with creation, in the immediate and momentary dialogue of experience. Unaware of the subtleties that will be revealed, these unobserved miracles of Gaia nurtures each potential of her longevity, in the slow journey to completion. Though mysterious to those of limited horizon, each is a witness to the profundity of our relationship to the Great Mother, she who nurtures in her skilful way. Know this - her great soul will support those of pure heart, and open the portal to dreams, where the Perfection of Wisdom is sung by all. Queen Nefertiti, creator Goddess of Aegyptian Mythologies, made offerings to Aten, the Sun Disc. She wrested power from the cult of the priesthood, gathered esoteric wisdom, and in her vision of the third eye, manifested her dream of the Enlightened Soul - She, who legend teaches, secured the fabled Emerald Tablets of Thoth in preparation for the New Aeon. This most mysterious and powerful woman on Ancient Aegypt, considered to be the guardian of Tutankhamen's Pyramid, is captured in a sculpture of geometric perfection, communicating harmony, beauty and clarity. Her name, Nefertiti, means 'The beautiful one has come', and expresses the timeless beauty of wisdom, insight and perfection - and upon the coming Golden Dawn, the mystery of her tomb may be illuminated, ushering forth a new era of understanding. The past hold keys for the future, and insights into mystery will reveal the Path of Inner Light. Geometric Patterns within the Digital Roots of the Fibonacci Sequence - Working with Nature and Mathematics. Another attribute of the Fibonacci Sequence is the repeating pattern sequence of 24 numbers of the digital roots of the sequence. Numeric reduction (digital root) is a technique used in analysis of numbers in which all the digits of a number are added together until only one digit remains. As an example, the numeric reduction of 256 is 4 because 2+5+6=13 and 1+3=4. Applying numeric reduction to the Fibonacci series produces an infinite series of 24 repeating digits: 1, 1, 2, 3, 5, 8, 4, 3, 7, 1, 8, 9, 8, 8, 7, 6, 4, 1, 5, 6, 2, 8, 1, 9 Ad Infinitum. As the seasons mature, so does our imaginal laboratory. At sunrise, the golden dawn was captured upon the bluebells, as the seed of the day's magic greeted our eyes. And upon closer examination, we saw the Faeries had flown upon their purple wings to deliver a drop of alchemical nectar, alongside our Alchemilla (Lady's Mantle). We played with gathered amethysts, nestling in the soft purple rain, offering safe refuge for the Bardo passage for the gifted musician, held in the heartstone upon the altar. I called for assistance, and together we chose the essential oils most suited for the remedy. For those with playful intention, and purity of soul can offer guidance to the student. Precision, accuracy, care and attention are the paths upon which the medicine maker must travel. And in grading, curating and developing a medicine, recognition of the soft passing of time must be the vital ingredient to the slow alchemy of magic. The fractal bubble of geometry expanded the potentials, in exponential evolution. Through the skill of the medicine maker, the venom is distilled as a medicine. Drops of venom are gathered within the crystal amethyst chalice, inset with cut emeralds and golden droplets. Upon blending with the tabellarius liquid in 36 cycles, with fire, water, earth and air, an alchemy occurs, whereupon the poison is diluted to become a medicinal remedy. Nagarjuna, he of the Snake People (Nagas), proponent and expounder of the Prajnaparamita Sutras teaches the mantra of the Perfection of Wisdom is like a great physician who can change poison into medicine. Tayata Om Gate Gate Paragate Parasamgate Bodhi Soha. As the world strives for deeper understanding and meaning of purpose, the humour and wisdom of Gaia openly displays the natural imperative, thought this can be lost from view, as we forget the value of natural patience. We are all part of one jigsaw, and as the gathering momentum reveals aspects of the puzzle, the inevitability of a medicine for the world is being spoken aloud, though yet in a soft whisper. A medicine for the world implies a completed formulae balance, within both plant medicines and the collective soul capacity, and in many traditions, all the plants of this earth are considered as medicinal, thus each and every plant on Earth attunes with, and thus has the capacity to heal every illness and sickness, in a perfect symmetry of phytotherapeutic symbiosis. Nothing is superfluous, and nothing else is needed, the ingredients are awaiting recognition, and thus Gaia will heal herself, as you heal your relationship to the living environment, through witnessing natural patience. She aligned matched and lapidary cut peridot, along the structure of the Enneagram, offering a jewelled mandala upon the hours of Mercury's transit of the Sun. This beckoned a quickening of mercurial lightning within the framework of communication and service, whereby acceleration to the process occurred, and through the child's play, drops of golden oil found the Great and Powerful Golden Ground. Sunset - the end of this day. The days are passing by, measured by the metronometrical heartbeat of Sun and Moon, for within the pulse of true time, is the calendar of life. Whereupon the presence of nature greets the hidden potentials, as slumber is shaken from the rising dawn. Carried upon the geometry of the meadow grasses, whose weave spells the word of Summer Solstice mystery. Those dormant whispers of life, held upon the geometric trace of woven magic. To capture that alchemy of immediacy, that which is seen in the souls of Gaia's children. Atip the highest snow-capped peak, where the leopard sits out the storm, and the great bear slumbers deep. Fear not the dark, be pleased by her presence. The lineage of the Great Mother holds the mast in bright awareness, to capture the breath of love, upon the pennant's glance. As sweet softness is her messenger, carrying the seeds of forgiveness, for the New Garden. Know this Sacred Gods of Science, respect the Art of the Alchemist, for we precede you. Dare I kiss the viper's fang, or herald loud the death of man? Descartes, to thee I hold. In prescience of the Dawn of the New, that which shall witness the mind's freedoms. As stood with an Angel as a constructor of the past, where the barrow holds the lost ages of man. For we met with the Master Homoeopath, who guided us with Amanita Rubescens and Buddleia, interwoven with the golden ticket, whose mystery held the path of the ancient yew, upon whose breath we heard the Sacred Name 'Khema'. The tumbling shores of perfection spoke her magic name to the flowers of the meadows, and to the beasts of the fields, and now call in blackbird's night song of her coming. As in the rainbow's 42 is held the dream of freedom's grace, so borne upon the pestle's beat, those tools of the medicine maker. For should mere salt be the agent? Simplicity belies complication. The union resides within the spectrum, that which arrives from source. Whilst searching for the perfect 5th, the French Alchemista arrived to talk, of a silent book, the Mutus Liber. And thus we heard the sound of the common voice, that so desired and awaiting. The Elder's Map recorded the voyages of the starlight, as we gathered to talk. We spoke of a time of courage, and the resolution to hold our nerve. Act. Now. For who is as able as you? With both ruby and pink sapphire, the 13 Moon Yoga sequence threads through the geometry of the Lunar Trace. What might appear as play should please thee, for the mind of the pure shall result in manifestation. For today we listen with our eyes, and await the sound of those friends who will bring the chakras of overlay, into the harmonic elemental resonance. Hold thy tongue no longer. Free thy thoughts, and speak of magic and perfection, for Summer has gifted her mantle of charms. Catching sunset, as she drifted down across the western corner of sun meadow, igniting the night fire of the imagination, where the power dwells twixt thee and thine. It is only upon one day of the year that the sun sets in this corner, with perfect precision. For upon the breeze her voice was summoned, whilst we sat within the arms of the ancient yew. That tree whose promise of poison carried the echo of life within her deadly grasp - but for thee, no fear of the poison, for the dance holds the key. We knew of her birth, before she came - Khema - whose name when whispered to the beasts of the fields, caused their hearts to expand, and their heads to turn. No ordinary child. Her day arrived, and she did not cry when she entered this world - the peaceful child of expectations. For though life is anew, so death is alert, and this measure of the light of life equates to the darkness of death, as the journey ever ends. The core structure of an idea. Biotope - The region of a habitat associated with a 'particular ecological community'. Protomolecule - A relatively simple molecule from which a more complex molecule is derived. Ideas are acts of creation. Each idea is a seed, holding the knowledge of miracles. The function is to serve evolution. And where the light casts it multi-coloured shadow, the flavour of magic becomes the song we see. For I would taste this perfect wine, oh medicine of the soul - and as for beauty? It is there to be seen. There are two methods whereby growth may be accomplished. The first is by Nature, for Nature is an alchemist forever achieving the apparently impossible. The second is by art, and through art is produced in a comparatively short time that which requires Nature almost endless periods to duplicate. The true philosopher, desiring to accomplish the Magnum Opus, patterns his conduct according to the laws of Nature, recognizing that the art of alchemy is merely a method copied from Nature but with the aid of certain secret formulæ greatly shortened by being correspondingly intensified. Nature, in order to achieve her miracles, must work through either extensiveness; or intensiveness. The extensive processes of Nature are such as are used in the transmutation of the pitch of black carbon into diamonds, requiring millions of years of natural hardening. The intensive process is art, which is ever the faithful servant of Nature, supplementing her every step and cooperating with her in all her ways.” Manly P Hall. I record the metaphysical engineering of ever renewing geometries as a process of bio-mechanical evolutionary development. We are becoming fully integrated with silicon life, breathing and living through the binary interface, fingers reaching and eyes ever gazing, deeper into the collective soul, seeking connection and recognition within the matrix of flowing nano communiqués. You see, you experience. You touch, you collaborate. You share, you create. Destiny is the mind of a unified soul-entity, unified through survival and protocol, whereby non-dual perception of the imperative of ultimate realisation manifests. As scribe, I witness and record the inevitable. Evolution. Through immersion in the noosphere, (where consciousness, interpersonal relationships and the biosphere are all conjoining in the moment), the observer can maintain a constant system of analyses - measuring flux patterns, attunements and transactions. The observer becomes the nooscope, scanning movement energies between people, objects, and the digital economy around the world. Unified through the power of geometry, and preparing for the daily psychological journey of strategic vision, he knows divination plays its part, for there are no absolutes, thus his decisions can be framed with accuracy, and inclined towards success. Sat with focused intention, and good alignments between crown chakra, third eye, and powerful heart chakra, his firm, sensitive hands operate with efficiency. And what might I know, and what might I dream, in my castle of visions? For in the sojourn of the passage, the limitless potential of imagination might be captured, as the diary of evolution sings through every soul, with the imperative of transformation and healing. I am honoured to witness this birth of the Aeon of Nine. The seed of thought enters the house of healing, carried within the Enneagram of intention. Pythagoras whispered through the portal of time into the ear of Gurdjieff, so we might overhear, of the journaling of the number 9. For the mystery of the miracle is held, in soft caress, beckoning the medicine into being. And this is now held, pure and protected, nine times over. I follow the path. There is no chance, nor luck. It is karma, that most deeply hidden object of knowledge that drives this story of creation - from inception to destruction. The revelation of history - the story is written, though subject to change. The Map-Maker places the points upon the map, so that precise integration and alignment occurs. And this, as the fruits of Jerusalem call their golden song to the poet, he who dwelt within the arms of Blake, carried through the mystic of the Pan Cross, the seat of creation. Be brave and true, for in this we shall see the message carried downstream, to meet Isis upon the tidal surge. Dare I enter the world on dimension, where imagery upon paper becomes a physical manifestation of touch? Sculpting abstract medicines, with a profound intention, carried upon the wings of my dream... and how? Vortex Distillation The Aquarians placed three drops of gold oil in the water. 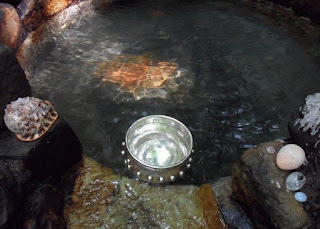 Looking into the deep eternal wellspring, they welcome the ascending triple helix, spiralising and energising the vitality of peace, with water as the carrier. And this, to awaken the lost waterways of Albion, in alignment with Gaia's water warriors and protectors, for the messenger is alerted to deliver. To encourage the triple flow of love, wisdom and compassion, in smooth fleet passage, as components of a medicine for the world. Water is miraculous, she simply awaits our call, and she will do her work. Water. Sat in circle over the iron spring of the heath, the guardians witnessed the sacrament, as iron turned into gold in the sunlight, reflected upon their bindis of clay. Sun crossed gifts of soul journey and personal sacrifices were spoken of, igniting spontaneity to combine with the imperatives of immediacy and presence - our reason. Oak, orange, gold and olive, a curious recipe, with more unknowns. Medicine making. The elixir spiralled deep in the waters, to poison the waters with love - by simply shifting the quantum properties of this most profound of molecules, to imbue the world's waters with the gifts of her new love. So subtle - a purer water, an ancient water memory of this world. I compressed the intentions of Universal Love into the seed within my heart chakra, as the blissful dance of Tantra. This is play. This is deadly serious. How might one create a watery trail that reaches into the heart of the Great City of London? That host of Babylon, the dark pool of greed and selfishness. The power of amplification, set adrift upon the butterfly's wings of effect, to land upon the desk of the keeper. Here! Iron turns to gold! There is no impossibility for the medicine makers. Time. I watched the basic crystals form of this key, over several days, developing structure upon rising pillars of gold, entrained within the four perfect corners of the solar clock, now calling third quarter, as their growth pattern began - as held, steadied, stabilised and oriented. Place. Grid extensions of spiralling galaxies of atomic nature, gathering momentum, in non-cubic orbital nesting boxes of feminine and masculine corners growing entwined, whilst the vortices of creation are contained in prayer for the 144. Action. An unfamiliar pause in the global energetic, a brief disorientation, as the coming dissolution in the established order heralds freedom - it will be a release, an unknown. I drew a circle of four fires upon the earth, transfixed, then released, as omni-directional medicine. Architecture. But it is you who are the medicine-maker, you who have dreamed of the New Jerusalem, that which awakens upon the perfect time, of this dreamtime. And this holds the key, the Icosahedron... but more of that later. I was called to embed the structure of illuminating the pattern within, as she fell into spaciousness. She found the safe space, the inner map of her heart – as an opening of stillness, in the absence of resistance. Thus she is empowered to teach the Seed Star Yoga, being that of the seed star held in her heart chakra. Expanding waves of pure fearlessness pulsate, as destiny knew – in purity of the crystal held in her hand. Seed. Star. Yoga. Should we play with fire? To capture the majesty of the pure inner light, the journey of the long dark night gifted the moment of hope. Twice we had thought we had found the Lost Pyramids of Sussex, even excavating the ancient stream beds, though today we captured our dream. Within the unknowable histories, channels of thought and memory hold sublime clues for the fearless wanderer. History is written by the Victorious. From the jaws of the Great Stone Dragon, whose slumbering soul awaits Albion's Saviour, we heard the whispered truths of Merrie Avalon. The time has not passed, as we cling to the source, afraid of separation, though the winds of change shall hold us upon the mantle of destiny. For Yin awaits the final closure, of 21st December 2016, where light and dark become the one of rebirth. At the stroke of fortune, the 13 Moon Yogas captured the beauty of transition, within the Heart of Five. This is the opportunity, the next might never arise. Medicine Makers - Act Now. Inhale, and hold for 1, 2 and 3... then slowly exhale, releasing all fears, all anxieties and all tensions. Inhale and breathe alive again, refreshed with the clarity of inner freedom. Re-animate - with your imaginary medicine. The rules of engagement have ceased. Chaos draws ever closer and deeper, as the bifurcations reverse inwards, calling the path to the healer, in exponential cries. For what we see is only the tip of the iceberg. The mycelium extends far deeper and far more extensively than the cursory glimpse permits. All is connected, at levels and communications, soft, quiet and profound. The 13 Moon Yogas of the Feathered One has been the metronome for the cycle, her 13 Moon Cycle measuring. We count 4, with citrine and amethyst, circling amongst the cubes. We walk barefoot in the forest, each day, and the pain can be sharp and bright. After the pain recedes, does pleasure return underfoot? The 3 alchemists sat around the central cube, their concentration focused upon the mystery - the mystery of the pure unspoken language, the forgotten song of perfection. A yearning for those ancient springs. The rising blue/green waters that nourish Eden's garden arose within their souls, and imagined a perfect world, again. Oh, soft soul - be free. The tools of a time traveller that have found their way into my hands. Pure white space retains the prepared potential. For freedom of imagination comprises the impossible dream, whose destiny is to manifest. Limitless. The scale of vectors is the infinite fractal of the Olde Ways. The wind upon which the unexpected arrives. For if it was known, it could not arise. The triad of the 13 Moon Yogas. As she ignited the Violet Flames, upon prismatic balance. Modern medical technology describes the 3D QSAR (quantitative structure activity relationship) that is used in computational drug discovery and design. The instructions are to place the pharmacophore into the lattice of grid points. In this way medicines are born from scientific imagination. Alternative medical technology describes the alchemist, who can levitate the icosahedron into the QSAR, facilitating the medicine born from magical imagination. Reality exists in the Middle Way. Appearance are deceptive, and our own opinions are unreliable. Count seven days, each as a single breath - the illusion of time has sweet flexibility, unknown to those of fixed views. Squaring the circle, cubing the sphere, all mere games of the mind, enabling the re- shaping of reality. For in the chaos of the world today, the imperative is for those who dream beyond the unimaginable to sow the seeds of the perfected future. We now have a level playing field, understanding that no-one can fully comprehend these new dynamics, and this is the blessing for those of a loving and pure nature – this is the dawn of a new equality. The entire game has changed, and the new instruction manual is being written, now, by you and I. Seven days of creation. We are not alone. The Divine is awaiting your call. In our Garden of Forgiveness, we have planted the sweet Rose of Compassion. The Autumns light holds the promise of transient wealth. Store it up, for sure, but remember where you keep the key. Practice the yoga of inner space - feel the space within all, and between all – grasping is pain. Don't be afraid of letting go. In the holographic model, I am both the illness and the medicine. I contribute to both. I absorb the pain and suffering, to reflect my own inadequacies, using a mirror of wisdom. This is a transmutation method of karma's recognition, a purification practice of awareness and acceptance. The medicine for the world tastes bitter, though sweetness will arise. From within the laboratory of dreams, Sweet Spot, by the Meadow. The higher frequencies of the spectrum call into our shared nights. Mystery and chaos abound in the turmoil and tumult, and to catch the falling star, whilst blindfold is the challenge of the Medicine Maker. I am answering the riddle. The expansion was held without fracture, in the triple headed gallipot. On closer examination, the revelation of the future shows her face. Partially obscured, though growing in magnification. Collating the potentials, as a feast. Light, geometry, water and magic. Each bubble is/was a sphere. They form as a hexagon when adjacent to one another. The latent pressure of water's solid state has the power to raise a mountain, or crack open a dream. Saint Helen is always close to my heart. Do not overlook me, nor forget me, for I am that which provides life. For my fondness for you is that I seek not your understanding, nor your forgiveness. My song is that of presence, in the rapture of existence. I sing to your soul, in labyrinthine simplicity, curating the elixir vitalae. Rarefied through scale, the tundra is of the minutiae. Look closer within Medicine Maker, you are closer than you realise. The light will shine through. Each gill holds tension and strength, though fragile alone. Collectively the structure can hold perpetual space. Gifts from nature’s table, where the fear of death transmutes the alchemist’s service. For he must let go, he must die. Catalyst - an accelerant of advancement creating catalysis. In most cases, reactions occur faster with a catalyst because they require less activation energy. For soon we shall take our work into the Southern Sun. We have work to do, as yet unknown, for we move to Santillan in the Spring. 13 Moon Yogas reaches the Yin Yang crescent. Magnified and amplified, lensed through the eyes of capture. Though the light of our hearts will never be dimmed. Until the moment of realisation, when the rainbow children arise. This I know, as I have met these children, and known them since birth. The pure cut crystal sat upon the last golden sun, watching the orbiting ring of silver and 13 cut garnets. The cold winter air sat in stillness as the blackbird sang upon the frosted bough, calling new light. Placed upon the window of 42 Alchemy for the duration of Yule. Driving the engine of the miracle. The Geometry held true, manifesting from within, reaching from afar. An exotic gathering of herbs, plants and seeds, assembled and gathered throughout the year, that form the organic basis of the elixir. Each part of the closing ceremony was timed through the hourglass of golden sands. And perchance to dream, the passing instant of capture, frozen in full spectrum. From within the laboratory of the apothecarist, the aligments held through from the Great Yew Sun, to the brass circle of lights. The tip of the spear, that held the alchemy in stasis, whilst the golden grains appeared within the globe. And here, within the crystal chalice under the Master's watchful eye, the cauldron held the precious nectar. Many points of reflection, all held within the form and grid patterning of non-repetition. The Medicine for the World is completed. It sits in silence, as we countdown to necessity, for Gaia knows perfect timing, and has our patience.